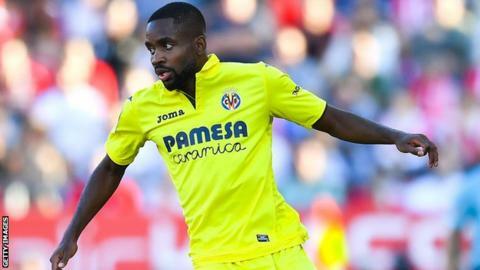 DR Congo's Cedric Bakambu scored again for Villareal on Sunday after he became the first African to receive Spanish La Liga's Player of the Month award. However Bakambu's twelfth goal of the season for Villareal was not enough as his side lost 3-2 to visiting Sevilla. Former Spain and Sevilla star Marcos Senna handed over the award to BakambuLink ahead of Sunday's match. The 26-year-old was given October's award after scoring six goals for the club last month. He beat Barcelona goalkeeper Marc-Andre ter Stegen and Valencia's Gonçalo Guedes to the monthly honour that has been awarded since September 2013. "Very proud to be voted player of the month!," Bakambu wrote on Twitter. The in-form Bakambu scored a hat-trick against Eibar in a 3-0 victory, grabbed a brace in the 2-1 away win at Girona and once in Villarreal's 4-0 thrashing of Las Palmas. Born in France, Bakambu started his career at Sochaux progressing from the youth ranks before he was promoted to the first team in July 2010. He scored 21 goals in 107 appearances in four seasons, which led to a move to Turkish side Bursaspor in September 2014, where he only spent a season producing 21 goals in 40 matches. Bakambu joined Villarreal in August 2015, racking up 22 goals in his debut season, but an injury-ravaged 2016/17 campaign saw him produced 11 goals in 34 games. He has scored nine goals in 12 league games and thrice in the Europa League this season. Bakambu played for France at youth levels winning the 2010 European Under-19 Championship on home soil and played as they finished fourth at the 2011 Fifa Under-20 World Cup in Colombia. He switched allegiance to DR Congo in March 2015; he has seven goals in 14 appearances for the Leopards and played at this year's African Cup of Nations in Gabon.